When I heard of Robin Williams’ passing, I felt a multitude of emotions wash over me. I remembered the childish Daniel Hillard rapping on the dinner table at his son’s birthday in Mrs. Doubtfire (1993); the stuffy Peter Banning recalling his bangerang days with the Lost Boys in Hook (1991); and the 26 year journey of Alan Parrish to escape the dangerous board game in Jumanji (1995). Needless to say, as a kid from the 1990s, Williams had a profound presence in my childhood and I feel so much sadness when I think of someone who brought laughter and happiness to my life is no longer with us. His role as the hyperactive alien would place him on the map, but it’s evident throughout his entire filmography that Williams had dramatic acting chops, in addition to comedy, with his roles in films like What Dreams May Come,Dead Poets Society, and Good Will Hunting (a role that earned him an Academy Award for Best Supporting Actor). 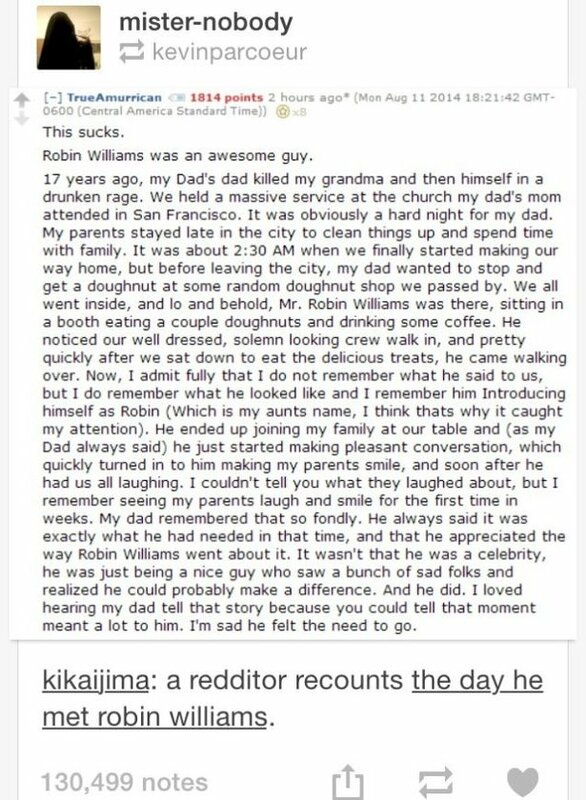 Through all of the chaos following his death, I found a truly inspiring and sweet story that I think speaks the content of Robin Williams’ character. In the end, it’s clear Williams’ goal in life was to make others happy despite his own personal issues. He saw the need for laughter and filled it. I hope his death will raise awareness about depression and the negative stigma against mental illnesses. Hopefully, this will cause others to see that even the people we believe to be the most cheerful and carefree could be suffering from an oftentimes debilitating disorder. If you, or anyone you know, is suffering from depression or suicidal thoughts please seek immediate help. Visit the National Suicide Prevention Hotline website for more information or call the 24 hour hotline @ 1-800-273-8255.